The stars at night are Big & Bright…deep in the heart of Kissing Tree! Big & Bright brought together local makers, musicians, chefs and more, and proved that everything really is bigger (and better) in Texas. Take a look back at some of our favorite moments from the weekend-long celebration with Texas Monthly. Kissing Tree residents came ready to enjoy a weekend full of food, fun and friends. Texas Monthly’s General Store offered a unique collection of artisan-made gifts – perfect for any Texan home. Texas Monthly Barbecue Editor Daniel Vaughn chatted with Hays County Barbecue about all things barbecue and business. Attendees feasted on all the fixin’s and listened to live music under a cozy Texas-themed tent. It was a magical evening under the Hill Country sky. The night was complete with live music, lots of laughter, campfire cocktails, gourmet s’mores and tales from The Texanist himself. Attendees feasted on sweet potato hash, French toast bread pudding and smoked salmon benedicts while listening to Texas tales and live tunes from Wendy Colonna. 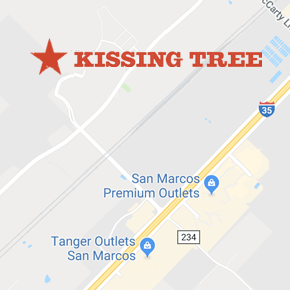 The Great Texas Tour took attendees around Kissing Tree’s eight model homes and the amenity campus, bringing the best of Texas to life at each stop. Even Fido (aka Ellie Nelson) joined in on the fun. Couldn’t make it out for the Big & Bright Celebration? Call our New Home Specialists at 512-456-3387 to schedule a tour of the amenity playground, which includes the brand new 18-hole golf course. We’ll have a cold one waiting for you at the Welcome Center!